The growth in craft beer brewing from 2013 to 2017 has been astronomical. There are over 5,300 craft breweries or microbreweries in the U.S. today, compared to less than 3,000 back in 2013. 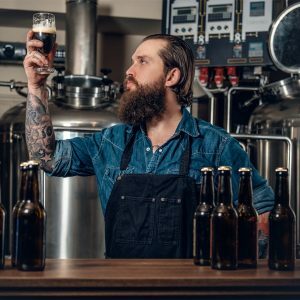 Many grew home brewing hobbies into full-fledged businesses. Transitioning a home brewing environment into a microbrewery requires scaling up. You need bigger equipment, along with more space and handling facilities for larger volumes of supplies and materials. This applies to the basic raw materials of beer like malt, hops and yeast, but also to the specialty additives like flavoring. Flavored beers form a major part of the craft beer market. Melon and citrus flavors lead the market in popularity. Honey and berry varieties are also showing strong growth. The evolution of craft breweries is great for beer aficionados everywhere. But, it’s important that these new breweries understand the hazards of the industry. Certain raw materials and additives for craft beer are flammable. Brewers also use corrosive chemicals for cleaning equipment and tap lines. Protect your brewery and your investment. Apply safe storage practices for the higher volumes of materials you will process. Hops is a plant product used to give beer its bitter taste. Brewers add it in batches at different stages of the brewing process to influence the taste of the beer. But, hops is full of essential oils and will ignite under the right conditions. Store away from sunlight and in a cold environment – for quality and safety reasons. Flavorings are extracts of a desired product in concentrated form. Brewers use extracts for flavoring because of their consistency in concentration. They can control the flavor of the beer more precisely than by using the product itself. Because extracts are oil based, suppliers mix them with carriers or solvents to enable dispersion into the beer. Propylene glycol is a popular choice, but it is a Class III flammable liquid. Another common carrier, ethyl alcohol, is even more flammable as a Class I. Learn more about flammable liquids here. Flammable liquids are subject to regulations and controls. Applicable standards include NFPA 30 and OSHA 1910.106, which define the categories of flammable liquids. International Building Codes (IBC) and EPA regulations also apply to the storage and use of flammable liquids. If the quantity of flammable liquids stored in a building exceeds certain limits, the IBC will classify it as a High-Hazard Group H occupancy building. In most cases, complying with H-occupancy requires major retrofitting of the existing building. But, there is a simpler and cheaper option to provide compliant flammable storage. U.S. Chemical Storage supplies fire-rated and non fire-rated storage buildings. Our SUPERLoc 4-hour fire-rated chemical storage buildings to contain flammable liquids inside the work area, or within 10 feet of the brewery. FIRELoc 2-hour fire-rated buildings can be located between 10 and 30 feet from an occupied building. Configure your storage building to your specific needs with optional climate control, ventilation systems and fire suppression. Use temperature control modules to keep storage buildings regulated at a fixed set point. Alarms alert operators to deviations. Temperature data recording helps you keep track of your additive history. Storage buildings come with racks and shelving for bags of product like hops. Or, they have ramps and facilities for pallets and IBCs to accommodate chemical containers. U.S. Chemical Storage supplies fire-rated and non fire-rated chemical storage buildings. Keep inspectors satisfied and employees safe by purchasing a chemical storage building for your brewery. Let our experts work with you to identify your risks and the best solution for safely storing your materials. Contact U.S. Chemical Storage for a free quote..
Slam. How to Brew Craft Beer: An Uncut Look Behind the Scenes at Civil Life Brewery.